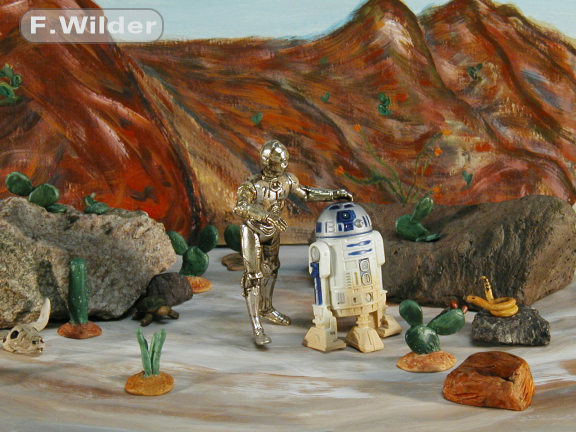 Here we find our favorite droids out for a stoll in the Southern California desert. C3PO gives comfort to little R2D2 as the pair encounter a rather nasty snake wagging his rattle ended tail and ready to strike. Below is a color 2D image. You need Red Cyan glasses to view this 3d anaglyph image. Color photo of the 3D image. There was too much red in this photo to work with the anaglyph 3D proccess so this one is regular old 2D for now. Star Wars Characters are ® Trademark Lucasfilm Ltd.